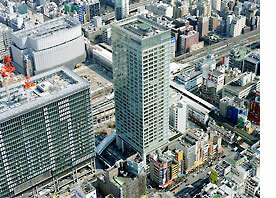 AKIHABARA Convention Hall | Overview - Convention Linkage, Inc.
Akihabara Convention Hall is located in front of the JR Akihabara Station. It is situated at the center of Akihabara Crossfield, a large project geared toward promoting industry-government-academia partnerships and creating new industries. Various events such as conferences, lectures, symposiums, academic forums, public events, exhibitions, and trade shows are held at the hall. 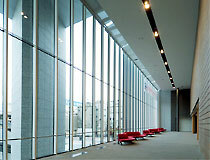 The hall has a spacious theater-type layout with the capacity to accommodate an audience of up to 450 people. 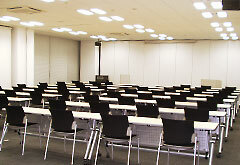 The height of the hall from floor to ceiling is 7 m. The hall can also be divided to create smaller spaces in order to host events such as keynote speeches, subgroup discussions, and buffets at the same time. 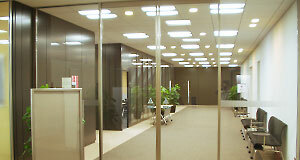 * The floors are equipped with fixtures and cable space for office automation. Power and LAN cables can be installed easily. Please contact us for details on usage hours and fees.